1. Miseries caused by our own wrong and harmful actions, just as you provoke a bee hive and you are stung up by bee swarm. 2. Miseries arising from your vices and passions and absence of self-control etc. 3. Miseries arising out of injuries from outside persons, spirits, deities etc. by way of their own first initiative and not as a reaction of any of your previous actions, thoughts, emotions etc. 4. Miseries arising by way of reaction of return punishments for sins and crimes committed in past lives (if you believe in rebirths). This variety is a solution to all mishaps locating in past lives’ actions, the corresponding causes for various inexplicable sufferings. 5. Miseries arising from ignorance and infatuation and great relishfulness for the enjoyment of life in its various infatuating aspects. The variety referred to in number 4 has maintained the greatest hold on the Hindu mind under the theory of what is called prarabdha प्रारब्ध or fate or nasib नसीब etc. This theory is most complicated and yet most illuminative and helpful in deriving every consolation during calamities. The standing problem almost ever unsolved for most of us is “which is more forceful, prarabdha प्रारब्ध or purushartha पुरुषार्थ,i.e. the fate or one’s own exertion.” The question takes another form and leads us to the questioning of man’s free will. “Is he able to do whatever he desires with his own exertions and soul power”? or is man subject to divine will of God, being mainly only a lifeless puppet in the hands of Almighty? In this matter the Mai-istic view is that both extremities are incorrect. It is not that man is able to achieve every thing if he has the highest will power and soul strength, or on the other hand that he is merely a doll with its strings in the hands of Almighty. With the honest and kindest purpose of raising a great reservoir of consolation and encouragement it has been the practice, of all great men in religion to be spreading the fatalistic belief namely ” Not a leaf shakes without the will and command of God. Every grain has thereon the name of its eater carved and engraved”. An intermediate solution of a compromise is sought by stating that the prarabdha प्रारब्ध of this life is only the reaction of the action of your past life and that therefore there is no ground for any dispute as to the superiority of prarabdha प्रारब्ध or purushartha पुरुषार्थ . A blind belief in prarabdha प्रारब्ध will make every man to be entirely paralyzed. The usual argument contradicting this view is that a man is unable to remain inactive even if he wishes best and most intensely and determinedly to remain to. The problem has therefore various sides, theories, arguments and explanations. The rational Mai-istic way of thinking is that of a reconciliatory nature. Every man’s every action, thought, emotion, purpose, goal, development etc. never dies till its effect is materialized by an opposite reaction. A bad action will never subside without bad reaction, although it may be, that it may not react except after a long time in this life or the reaction has to be experienced in any of the future lives. Thus every man’s action etc. are divided as (1) Kriyamana क्रीयमाण (2) Sanchita संचित and (3) Prarabdha प्रारब्ध . The Deities in charge of administering justice, taking whole stock of all actions in past lives, mold up a certain pattern of life in which certain events are marked out as never to be violated, evaded or annihilated e.g. the family, the country, the religion etc. in which a man is born (2) his wife, children, friends etc. (3) the general social status and financial position etc. (4) most remarkable events which change life wonderfully etc. and (5) sufferings, calamities, diseases etc. It is only these events which cannot be altered by man’s own powers, exertions etc. The rest is alterable by his own wisdom, precautionary actions and invoking the aid of God and Guru. Man’s particular points of abilities of gratefulness, greatness, goodness, givingness, godliness and goingness are all personal achievements and they do surely go to alter and modify all miseries or increase happiness and joy, although of course subject to a certain range of certain limits. To give the homely example, it would be a matter of prarabdha प्रारब्ध that a man would live his whole life, say as that of an officer with a pay ranging from Rs. 300/- to Rs. 800/- per month. In this case his own personal goodness, ability, character, religious understanding, moral behavior etc. will surely enable him to live his life as on Rs. 800/- per mensem even from the very commencement. This is mostly with reference to physical, external and out side events in a man’s life easily visible to others around. This behavior is only delusive way of judging things. What every man is finally concerned with is the actual joys and sorrows, happiness and miseries, pain and pleasures etc., and here the mechanical power of prarabdha प्रारब्ध remains entirely subdued to the individual who has already developed his mind and heart to derive its joy from higher culture and sources of happiness flowing from a clear conscience, sublimated heart, and intellectual subtle understanding of religion, an upright moral character and a fully surrendered devotion etc. There should be no confusion in view of the several theories prevalent in religious atmosphere about prarabdhaप्रारब्ध regarding the efficacy of prayers to God. In as much as, as explained above, there is widest range even between the limits laid down by prarabdhaप्रारब्ध itself. For instance it is no less benefit that a devotee or an individual bearing a good character may enjoy his whole life as an earner of Rs. 800/- per mensem although he is entitled only to a starting pay of Rs. 300/- per mensem. Thus the more practical and all measuring individual you become, the more apparent becomes to him the most precious benefit of being a devotee offering ardent prayers. The most mischievous ignorance lies in, the fact that ordinary thinkers are most loathsome to enter into details and run from one extreme to another, not recognizing the intermediate stages. For instance, if a man has committed a crime, he expects by prayers to be entirely declared fully innocent and then alone he would admit that prayer have any meaning. He could not see anything like an effect of a prayer if for instance although he would have deserved a punishment of four to six months, if the prayers softened the heart of the judge and he was sentenced to be in the court till the court leaves. Such instances of refusing to accept the efficacy of prayers if they result in part relief of the otherwise intense suffering, leads us to conclude that those who make approaches to prayers of the said type are in reality, in their heart of hearts, out and out selfish, blind, senseless and self-benefit-seekers alone. They have no serenity of a truth seeker who is on the task of arriving at a true decision as to the efficacy of prayers. As explained, the prayers offered to Almighty not only modifies and alters the prevalent condition of every man with reference to his outward circumstances, conveniences, comforts, calamities, illness, diseases etc., but more important than that, prayer enables the devotee to bear any suffering with every cheerfulness and courage. It is this which explains the mentality of all martyrs. The devotee is under the great care, supervision, protection, guidance and suggestion of the particular Deity to whom he surrenders himself. Although it cannot be denied that such a devotee has to suffer for his wrong actions in this life or the past lives, a good deal of relief and even an entire forgetfulness of the miseries and an absorption of the very consciousness during the period of suffering is no small Grace and boon of Maai-Maiji for all the efforts and sacrifices that man has undertaken to turn to devotion, relinquishing the worldly pleasures and comforts. There is nothing that is solidly attainable for any man who is not prepared to pay the price in one shape or another for the happiness or relief which he expects. It is evident therefore that neither the path of prayer or devotion is meant for a man who is under the delusive notion of purchasing heaven for a penny or a flimsy deceitful praise. Humility and sincerity is the first requirement of the path of true devotion. Any amount of weakness would be tolerated, but not an atom of designed, schemy, game-playing in intriguing wickedness. On the other hand if there is a plain and simple heart which lays all its cards completely opened before God and Guru such a man is sure to be elevated to a most wonderful degree, even though he may be at the lowest bottom of vice, sin, and crime. The fact of facts is that he has surrendered his own egoism and handed over himself to God and Guru, who necessarily in one sense are responsible and another sense most intensely interested in securing the highest welfare both temporal and spiritual of the surrendered. The whole question of relieving miseries either physical or mental or of the heart thus reduces itself to one of offering prayers to one’s own beloved deity with every humility and sincerity under the guidance, supervision and fullest sympathy of God and Guru. 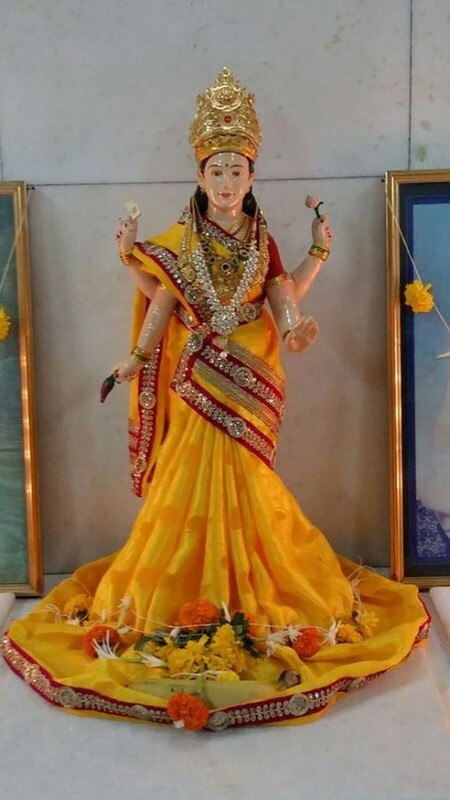 It may not be possible for each and every man to have a good fortune of being able to be in contact and service of an able and merciful Guru, but all the same an ardent spiritual aspirant would do well to make head-way on assumption of Mai (in the individual case of Mai-ism) as both God and Guru. After a certain maturity, worthiness and collection of Punnyam पुण्य (merit), Mother Herself is sure to put you in the path of a Guru. Regarding the relationship of Guru and disciple more than enough has been stated in Hindu scriptures. In as much however as they represent one side alone in favour of treating Guru on the same level as God and in as much as in the later ages after scripture writings including the present age, a good deal of mischief, deceitfulness and exploitation of blind faith has been practiced by religious cheats, this problem has become most vexatious. Here too the world has continued to commit the same blunder of not recognizing any intermediate stages between Guru as God at one end and absolutely none as a Guru on the other. Mai-istic view on this subject is that a Guru has to deal with his disciples as a mother deals with her children, that a Guru has to be the disciple of his disciples, that no Guru shall ever forget that he is only, although a super-man, an infinitesimal part of the divine final most Universal Mother. He should never be unconscious of his own secondary position even though it becomes most delicate for him to refuse to his disciples the highest benefit of identifying their Guru with their God. In the special case of Mai-ism there is an additional requirement, namely that Mai-istic Guru has to deal with all women as “Mother”. The Mai-istic Guru should not allow himself to be worshipped unless he gets fully sure that any refusal of his to be worshipped would result in a great shock of depression in the heart of his devotee. His attitude during such worship should be one which would assure his worshippers that the Guru is prepared to be the worshiper of his disciples, as well. Mai-ism is extremely rationalistic and thus takes into consideration the human frailties of a Guru as also the inconsistencies of the disciples and further the inability of a Guru to achieve the spiritual progress of a disciple in some particular avenue of religious development. Surely the disciples’ further progress should not in any way be handicapped, but on the other hand it is a matter of fairest justice that whatever sacrifice the Guru has made for the disciple till the moment of the imagined breakage should not be treated with ungratefulness. The most mechanical measure that Mai-ism advises in such cases is that the disciple should make a clear declaration of his abandonment, so that no misunderstanding may subsequently follow and ruin the disciple invisibly. It is surely a great moral criminality for any disciple to be internally severed from his Guru and yet to deceitfully maintain appearances of previous relations with Guru. On this point Mai-ism takes the broadest and most practical view. It says in fact there is not a single being who never had a Guru if Guru means simply one who gives guidance, instructs, informs or leads. The real fact is that the worldly people evade being placed under any obligation on recognizing a certain person as a Guru. In a word such ones are only younger brothers of men seeking to buy heaven with a penny and are for begging, collecting and snatching precious teachings and points of illumination and understanding without paying, even the smallest price. Another matter is that it is the most impracticable thing that the whole world can efficiently be treated by the best Gurus who are fewest in number. Therefore it means that the usual most common practice of considering some highest super-man as one’s Guru without any living contact whatsoever, merely taking a distant Darshan once a year or hanging a wall picture has very little meaning although it should not be denied that it is hundred times better than having no impressions whatsoever in daily repetitions about saintliness and spiritual qualities and religious and moral conceptions, routines and imbibings. The most practical thing is that one who has once for all decided to be a religious aspirant should have his own Guru, be he only a step higher than himself. Then and then alone can he develop his spiritual virtues and powers. Of course being in a distant contact in imagination, emotion and thinking about a Guru with whom there is no direct contact is also by itself no small spiritual benefit. If the devotion is intense there are instances of most wonderful achievements even when Guru is not at all aware of the discipleship with love and service of a particular aspirant. 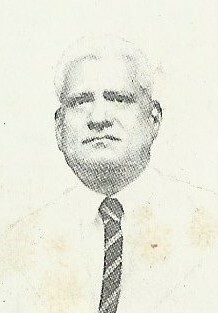 The soul power of an man by itself is no small force for further progress and elevation but all the same the fact remains that in one case there is the pulling up by one engine alone whereas in the other case, it is the combined action of the spiritual forces of two engines and some time even three namely that of the disciple, God and Guru. Considering all the facts and taking the highest essence not only of the different teachings of all religions, but of various philosophies, customs and conventions, the most pervading force for the elevation seems to be that of most intent attraction between any two entities namely the disciple and Guru, the disciple and God and God and Guru. And there can be nothing more efficacious in the matter of relieving miseries and making solid progress than that of the wonderful force of love and service as between any two of the said three relations, when most single-mindedly resorted to and it is what is known as the quintessence of Mai-ism. 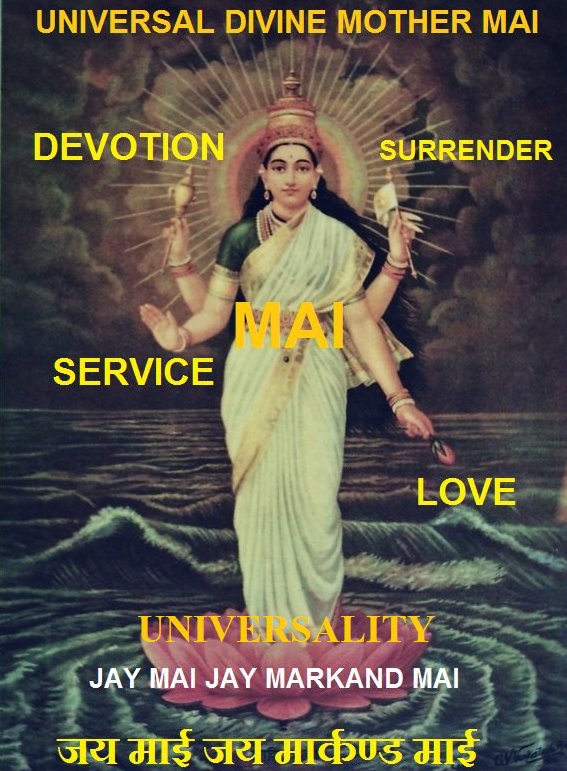 Mai-ism in one word states: believe God to be Mother, Universal final-most Mother of all. Develop your highest powers of loving and serving others with devotion and self-surrender to the divine will of Almighty Mother. Mai-ism consists of six tenets alone, leaving the rest as only secondary to be adopted by any aspirant in the best manner he chooses and what appeals to him the most. There is nothing more clear than that in as much as Mai-ism dispenses with all other things passing under the name of religion but these particular tenets should be lived out as far as possible in every moment of one’s life. Coming next to the practical side especially about the relief of miseries, those physical and mental as also emotional, Mai-ism lays the highest emphasis on intense prayers, worship, thanks-giving, sadhana, introspection, meditation, communion etc. But all these should be only as a second step after the preliminary grounding has been sufficiently matured. The very first requirement in order that the prayers under Mai-ism be most successful is that you must have risen at least to the state when you feel a unique joy of rendering service to any one in distress that you come in contact, to the extent of your possibilities.If this basic requirement alone with humility, sincerity, honesty, obedience, reverence, worshipfulness etc. and more than anything, the recognition of divinity inside every human being is not there, Mai-ism does not recommend any one to proceed further in a wasteful manner regarding the essence of life on the path of devotion. Mai-ism lays highest emphasis on Universal love and service to be practiced in daily life, so much so, it places that practice on a higher level than all other known mystic methods prevalent till now. Mai-ism states, the man who loves others who is devout and lives the life of self-surrender is many times much more powerful even in altering his own circumstances, environments, tendencies etc. than the man who has learned all scriptures, who has mortified himself by sitting in the caves, who has awakened his Kundalini, who has repeated millions of mantras, and who has performed most mysterious expensive and elaborate ceremonies. The greatest vexation met with during the efforts of either the disciple or the Guru arises from the greatest difficulty of segregating persons of true sincerity and humility from the hypocrites, non-believing self-serving opportunists. More than ninety per cent of any religious preacher’s life-long efforts have been most pitiably wasted because of the impossibility of segregating the two classifications. The greatest obstruction arises the human nature of seeking unearned benefit in every possible way. The self-seekers are not prepared to form their own independent class with an open avowal of their contradictory principles, beliefs etc., in a fair and just manner. They are for offering every opposition to the progress of any religious activity by any one aspirant and yet if by chance he is successful in sowing a seed and growing a tree, these opportunists immediately turn their sides and are the first to do away with aspirant and enjoy the fruits of the tree the unfortunate aspirant has grown. There are several varieties pointed out in the great scripture of Mai-ism of the different types of obstructive people. They are being briefly recapitulated with the specific instruction to an aspirant to make sure that he does not fall in any of these classifications. The most predominating class is that of persons with highest ignorance about religion as a scientific process in spite of their highest academical education. These people believe prayers or particular religious undertaking for the fulfilment of certain desires to be entirely independent things which by themselves bring forth the desired results just by way of mere mechanical process in which neither character nor goodness nor general religiosity and moral conduct or religious true understanding has absolutely anything to do. The prayoga प्रयोग or anushtana अनुष्ठान that is a spiritual understanding of a certain ceremonious nature brings forth results in an automatic manner, just as any person on switching on an electric button or turning a tap gets electric light or water. If one undertakes an extremely detailed inquiry, one would be stunned to find at the end that almost 99 per cent of religious believers unfortunately fall in this class. The Founder of Mai-ism had so many instances of experience where the highest worshippers, meditators, ceremonials, strict followers in every detail have entirely failed to get any smallest shadow of fulfilment. In fact it is the most unfortunate thing that in religious life generally speaking, morality, character, goodness, love, service, sacrifice etc. have stood completely divorced. Here Mai-ism out and out disagrees with the prevalent notions of giving highest value to scriptural knowledge, various modes of devotion etc. and taking and taking the other part to be of an entirely negligible nature. The said one being the most predominant mentality, it is so often repugnant to find a shocking fact namely of the so-called disciples have absolutely no idea and no belief that their Guru or one who has shown himself to be capable of moving the deity to confer certain boons or grace must invariably be a man of the highest character standing at the highest apex in religion of virtue, sinlessness, purity, world-detachment and relishlessness regarding all the joys and pleasures which life with its various sources of happiness can give. Here is the highest ignorance of average people and Mai-ism while it has the highest reverence for them and their most precious and effective method of progress most pointedly and poignantly emphasises the removal of the said most glaring blunder. If in the heart of hearts there is nothing else but a desire to get a certain desire fulfilled, let the fact be most openly declared rather than hypocritically cheating your Guru and on the top thereof sitting on judgement on him. The second variety is that of ungrateful people who entirely turn away their face from God and Guru as soon as their desire is fulfilled. There are so many varieties of different mentalities obstructing the free flow of religious progress of the divine grace that there would be no end to the description thereof. We therefore pass over this subject even abruptly. Coming to the constructive side of prayers under Mai-ism for the fulfilment of various desires including especially those of curing illness, removing poverty or shattering of any specific calamity, the best thing is to get instructions in every detail from your Guru, whoever he may be. There is absolutely no question about efficacy of prayers. Only thing is the fulfilment may not be to the highest completion if the forces to be dominated are too strong to be mitigated or annihilated by prayers offered. It has been the experience of all devotees in the past and will remain to be the standing experience in the future. The poor have become prosperous, patients of incurable diseases have become healthy, lunatics have been wise, the homeless have built bungalows, the unemployed have become officers, unmarried have got suitable matches, marital disunion have been reconciled, connubial relations have been more relishing, heartbreaks have been healed up, worries of impending calamities have been tided over, barren women have delivered sons, down-falls from heights have been hurtless, business has flourished, litigation have succeeded, relief, solid help and entire removal of miseries have been attained and many other miracles have happened on staunch devotion to most merciful Mother Maai and most beloved Maiji. In one word, Mai-ism pushes you forth to go ahead if you want your miseries of any sort to vanish, on lines of true religiosity in a universalistic and rationalistic and scientific manner. Success is surely yours. It does not matter at all which religion you belong to, which Deity you are devoted to, which particular Guru you have accepted, which philosophy appeals to you, which methods of spiritual progress you are resorting to. The most important, final most as well as most fundamental things that will lead you to success are humility, sincerity, honesty of purpose, single-mindedness, love and service to all you come in contact with, devotion to the Deity you select with unconditional cheerful self-surrender to the divine will of God Almighty of whatever conception you choose to have.